Beat egg and milk until blended. Place in shallow container. Refrigerate until ready to use. Spread one side of each slice of bread with mustard. Layer ham and sliced cheese over mustard on one slice. Top with second slice. Dip both sides of sandwich into egg mixture. Cook on 350°F oiled flat top grill 1 to 2 minutes per side or until golden on each side. Place sandwich on half sheet pan. Bake in preheated 350°F convection oven 2 to 3 minutes or until cheese inside sandwich is melted. Remove from oven. Sprinkle one side of sandwich with shredded cheese. Return to oven to melt cheese. Remove from oven. Sprinkle top of sandwich with coarsely ground pepper. Cut sandwich diagonally in half and serve. Honey Dijon mustard 1 tbsp. John Morrell Ham-Off-The-Bone 5 oz. Cook hamburger patty on flat top grill to desired doneness. 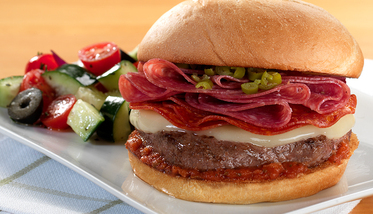 Remove patty from the grill; top with pepperoni, salami and cheese slices. Place under salamander to melt cheese. Spread marinara over bottom half of bun, top with layered burger patty and sport peppers. Cover with top of bun and serve. frozen hamburger patty 16 oz. thinly sliced Patrick Cudahy Pepperoni 1 oz. thinly sliced Patrick Cudahy Hard Salami 1 oz. diced sport peppers 1 tbsp. Cut sausage into 3/4” thick slices. Heat oil in a large skillet over medium heat, cook and stir sausage until browned, about 8 minutes. Remove to a plate. 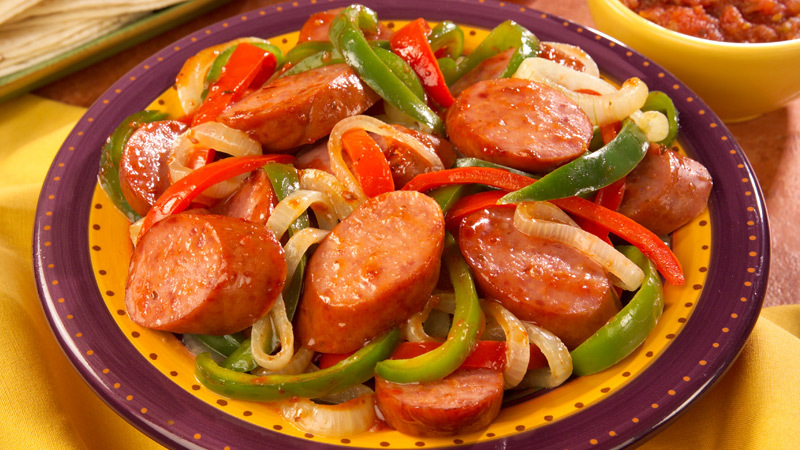 Add onions and peppers to the skillet; increase heat to medium-high and cook, stirring frequently, until golden brown and crisp-tender, about 10 minutes. Stir in lime juice and chili powder. Return sausage to skillet and cook until heated through, about 3 minutes. Spread tortillas on plates; equally divide sausage mixture on tortillas. Roll each tortilla around the sausage and vegetables; serve immediately. Serve with guacamole, sour cream, salsa and pickled jalapeño slices, if desired. Eckrich® Smoked Sausage 14 oz. 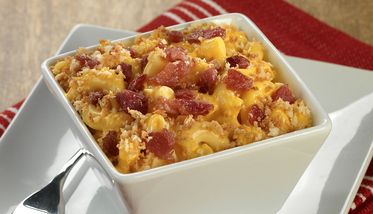 Pair crispy bacon with baked macaroni and cheese for a delicious twist on a creamy classic. Melt 6 tbsp. butter in medium saucepan on medium heat, then whisk in flour, Worcestershire sauce and spices until smooth. Gradually whisk in milk, stirring constantly. Bring to boil until thickened, stirring frequently. Reduce heat to low and whisk in cheese until completely melted. Combine cooked pasta, bacon and cheese sauce. Pour into well-sprayed half-hotel pan. Melt remaining butter in small saucepan. Stir in bread crumbs until coated and sprinkle crumbs over top of macaroni mixture. Bake in 325°F convection oven 13 to 15 minutes or until top is light golden brown and mixture is bubbly. All-purpose fl our 6 tbsp. Coarsely groung black pepper ½ tsp. sharp Cheddar cheese, shredded 1 lb. short-noodle pasta, cooked and drained according to package directions 1 lb. Set a pizza stone on the center rack. Preheat oven to 450°F, or higher if possible. Sprinkle some flour on the work surface. Saute peppers and mushrooms in canola oil over high heat for 6 minutes. Add Worcestershire sauce and simmer one minute. Lay each of the flatbread on work surface. Drizzle 1 tablespoon of the olive oil over the surface of the flatbread. Sprinkle 1/3 of the provolone evenly over the dough and then repeat with the beef and peppers and mushrooms over the surface. Pick up the peel and open the oven door. Gently slide the flatbread onto the stone; a few shakes of the peel and the dough should slide right off, thanks to the cornmeal. Bake the flatbread in the oven for @ 13 minutes, until the cheese is bubbling and the crust is charred. Garnish with fresh parsley leaves.